Our friendly and accommodating staff at Palmetto Dunes Oceanfront Resort is pleased to assist a bride and her guests from the initial wedding inquiry, though the couple’s last dance. The resort is home to a variety of beautiful venues for bridal luncheons, rehearsal dinners, groom’s golf outings, wedding ceremonies and wedding receptions. Dunes Catering & Events, the on-site catering team, can help with menu selection, create a custom wedding menu perfect for each individual couple or cater to an off-site location. We can’t wait to make your wedding dreams a reality. 888-322-9091. Beach weddings. Church weddings. Coastal weddings. Golf course weddings. Harbor-side weddings. 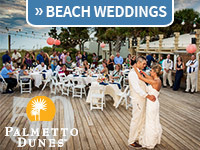 When it comes to tying the knot, Hilton Head Island weddings are the ultimate way to say “I DO!” With romantic beaches, a moss-draped environment and an abundance of wedding facilities, expert wedding planners, wedding cake designers, florists, photographers, catering and limo services, you can create the ceremony and reception of your dreams.